After a false attempt – note Harry the dog is very keen for me to achieve the goal. Then there was the second attempt and success!!!! It has been 1505 days since the crash and quite a rewarding journey. Thanks to Dr Wheel , arm therapists Melanie and lately Hayley who has ensured the Stubbie goal was achieved. In my last blog I described the new challenge of drinking from a Stubbie by Christmas. The goal is proving more challenging than expected! Like all things when you analysis them it is more complicated than expected. It is not simply raising the arm; it also requires a tilt of the hand at the last moment. This is all fine with an empty bottle, but as soon as you put weight in the bottle then the arm and wrist collapse. All this indicates more strengthening is needed. So the next two weeks will see intense practice to try to get the strength to meet the goal. My arm therapist, Hayley has got me doing multiple exercises replicating the action laying down, sitting and standing. If it works I will be able to drink anywhere. Not sure that is a good thing. Anyway here is the evidence of progress so far – this drink bottle is empty and plastic – so very light, but it gives hope that the action is achievable. I have been contacted in recent weeks by a few fellow brachial plexus sufferers and it has made me a little guilty that I have dropped right off in keeping the blog up to date. The latissimus dorsi surgery I had last year has been effective in giving me more lateral rotation however it is still very weak and any resistant at all means I can’t rotate the arm. The great advantages are that I can use a fork to eat, run without my sling (which is now not needed) and when my arm is by my side it hangs with on a normal angle. My arm therapist is now Hayley and we have established a new goal, “drink from a stubbie”. I can hold the stubble, raise it slightly but can’t quite get it to my mouth. There is hope as, despite the surgeon’s view that my deltoids are stuffed (to use a technical term), there seems to be something going on and I am able to raise my arm slightly suggesting the anterior deltoid might be working. We have set the goal to be achieved by Xmas, fairly ambitious. Last weekend I succeeded in doing my first full triathlon since the accident. I have done a few small ones but the swimming with one arm has been challenging. 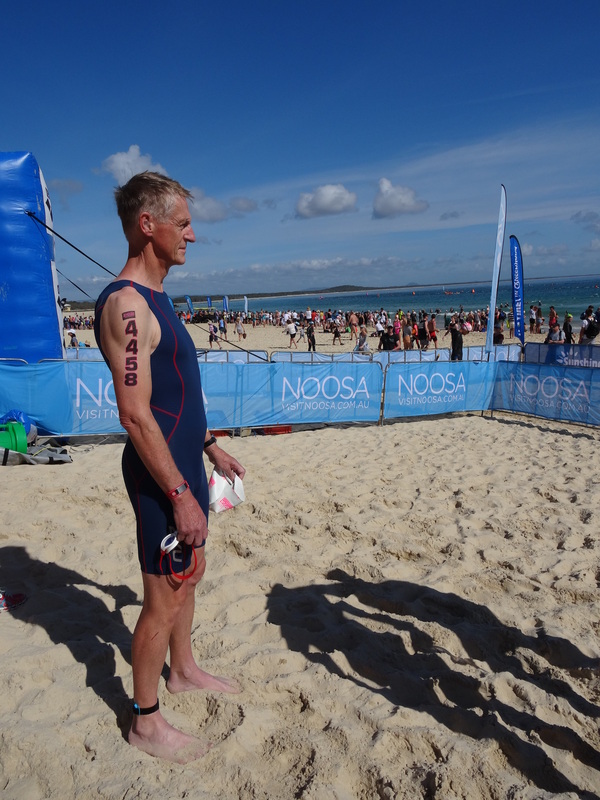 Since the accident I have done the run leg of the Noosa Triathon as part of a team. Yesterday I did the whole race – 1500m swim, 40km ride and 10km run. The swim was in the ocean and thankfully the weather was kind and the water flat. I am in trouble swimming with one arm in choppy water. I found the swim hard but really enjoyed the ride and run. The Lat Dorsi operation has really helped my riding as the arm feels a lot stronger on the handle bars. I am yet to decide if I keep doing the longer triathlons. I need to let the “forget hormone” kick in and then decide. It is nearly four years since my accident and I quite vividly remember meeting another patient who was three years down his journey and couldn’t imagine three years of operations and therapy.. The time has flown and whilst my arm has limited use each operation and the therapy have made gains. I suppose the message is believe and keep working at it. I reluctantly write this post as my propensity for injuring myself is at the point of embarrassing. Anyway always believed in honesty. In my last post I was demonstrating my external rotation in the lovely surrounds of Bali. On our second last day I headed off for a beautiful and safe 6km run along the foreshore in front of a series of resorts in Nusa Dua. You wouldn’t believe anything could go wrong. Well I managed to disprove that theory. About 1.5km from home I tripped on a piece of concrete and being in my running sling, fell forward with only my right hand to support me. I hit the found hard taking lots of skin of my right hand and knee and then lurched to the left and without a hand to support me rolled splitting my left eyebrow open and crashing to the ground. I gathered my thoughts and with blood flowing staggered back to the hotel where I was taken to the clinic, a doctor called, and my head stitched up with 4 stitches. As I sat up after being stitched I had an agonising pain in my side. I decided to go to the toilet and when I urinated I was alarmed to see lots of blood. To say I went into panic is an understatement. I was quickly sent to the local hospital and a quick ultrasound followed by CAT scan revealed a Grade 4 (the second worst) laceration in my left kidney and a leakage in the ureter leading from the kidney to the bladder. I couldn’t believe this had occurred from a simple fall. It is fair to say no one wants to be facing the possibility of surgery in a Balinese hospital. I was no exception. The doctors at the clinic consulted a urologist in Bali and the decision was made not to operate but immobilise me for as long as it took to stop the bleeding. Luckily the visible blood in the urine disappeared after 24 hours but it continued at microscopic levels. I was relieved to have avoided surgery. I must say that the Bali International Medical Centre was a high quality hospital with outstanding facilities, doctors, nurses and hygiene. I was so lucky to have been sent there. After 4 days I was allowed to leave the hospital in a wheelchair and sent back to the hotel for another 3 days. They wanted to then test my blood to make sure the counts were higher enough for me to fly. The accident happened on our second last day so we were facing an extra week in Bali. After 3 days we nervously went back to the hospital for the blood test hoping for a good result as we were desperate for the safety of home. Luckily the result came in at the correct level and we were able to fly home the next day, exactly a week after the accident. On return to Australia I have now been assessed by a urologist and had further CAT scans and I am progressing well. There has been no further bleeding and I am hopeful of no complications going forward. The urologist has indicated I have to be vey careful as a further bleed could result in the loss of the kidney. We have agreed that I should do nothing but exercise by walking for the next 4 weeks and then I can gradually rerun to running and swimming. I am in no rush to take risks. As you lay in bed very ill you consider why and how this can happen? I am not sure of the answer except to say I was bloody unlucky as all the doctors can’t believe a fall could cause the injury I received. There is no doubt the most likely cause was the sling. As I fell the arm in the sling was rammed into my side and I suspect the elbow gouged into my side compressing the kidney. Also running in the sling has changed my style and I do tend to do a version of the Cliffy Young shuffle. I am committed to getting myself healthy and maybe stop pushing myself so hard, but not sure how long this will last as I love the exercise and the sense of achievement that goes with it. I will miss the City to Surf and instead be the support crew for Kerry, my wife who I put through some very stressful times. 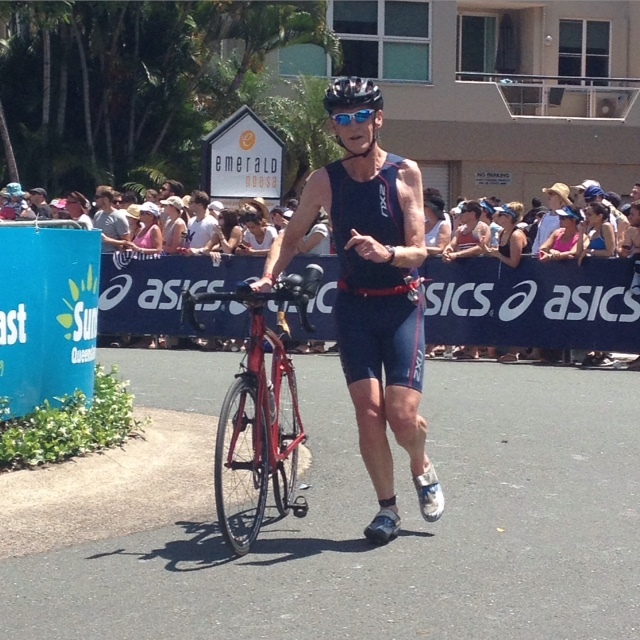 I hope to still run the 10km at the Noosa Triathlon in early November. I look forward to 4 relaxing weeks and the dogs can expect daily works. It has been 3 weeks since I have been out of the sling and gradually I have been able to extend the movement of my left arm. The intent of the surgery was to produce external rotation and the results have been nothing short of miraculous. Dr Wheel is a genius!! Before the operation I could not move my arm from my chest no matter how hard I tried. The following video was taken by the pool in Bali – sorry for lack of t-shirt. Interestingly I am only slowly reintroducing the use of my arm as it lacks strength and the habits of 3 years die hard. My hand still has significant loss of feeling which also creates uncertainty. Last week I discovered I could push the buttons on the car radio, I can hold a plate with my left hand whilst I put food on it and remarkably I can use a folk to hold food whilst I cut it. Simple little things that I am very excited by. The next challenge is to hold a beer with my left hand and drink it. I am close to being able to do it. Should be the next post. Well after thirteen and a half weeks in the “sling from hell” I have finally been freed. Therapist Mel gave me approval on Friday to get out of the sling under strict conditions. She plays it tough and it needed United Nations type negotiations to advance my cause. A slight tantrum a week ago resulted in a timetable of release being documented and agreed. I am allowed out of the sling with no exercise until next Wednesday and then I can swim one arm as long as the bad arm stays close to the body, and run in my running sling provided I keep at least a 5cm gap between my body and arm. Most significantly I am allowed to run up to 10 minutes without any sling. I can run without the sling now as the operation allows me to hold my arm pointing forward – something I could not do in the past. I have 8 weeks to the 14km City to Surf in Sydney and having not run since March – it will be a challenge. This video shows me sneaking a trial run without the sling a week ago. All signs are that the operation has been success. As mentioned I can hold my arm pointing forward and also get some internal and external rotation. Hopefully this improves with further strengthening. I believe that is the last of the operations, so now it is up to me to do the strengthening and flexibility work necessary to get improvement. It is 10 weeks since the last operation and frustrated is an understatement. It appears that I will be in “the sling” for the full 12 weeks plus some more. I have set myself to run the City to Surf in Sydney on the second Sunday of August as a goal and can see it going down the drain. The arm therapy is progressing very slowly and I can’t see how, if it continues at this rate, I will be running the distances needed to get to Sydney. Dr Wheel indicated that I would be running in my running sling after 12 weeks, but as the sling holds my arm in an aggressive position in relation to the surgery I am now told this would not be good. Instead it has been suggested I should run without a sling. Given how I have lost all muscle definition in my shoulder I am not sure how this is meant to happen. The plan is to try running in 2 weeks, let’s hope it feels good. I know I am an impatient pain in the backside, but I am over this and want to get on with living a normal active life.